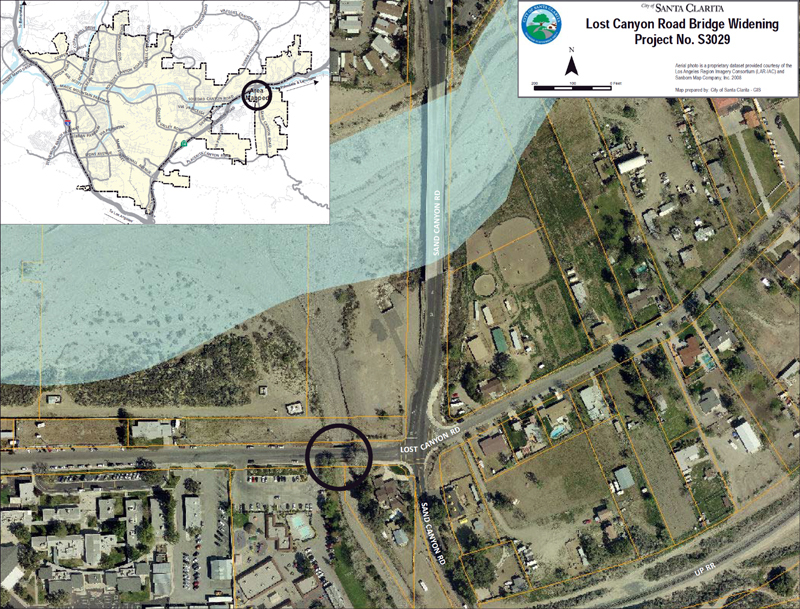 SCVHistory.com SC1203 | Canyon Country | Lost Canyon Bridge Widening: Design Contract 2012. * City Council award the design contract for the Lost Canyon Road Bridge Widening, Project S3029, to Biggs Cardosa Associates, Inc., in the amount of $295,990, and authorize a contingency in the amount of $29,599, for a total amount of $325,589. * Authorize the City Manager or designee to execute all contracts and associated documents, or modify the awards in the event issues of impossibility of performance arise, contingent upon the appropriation of funds by the City Council in the annual budget for such fiscal year, and execute all documents subject to City Attorney approval. The existing Lost Canyon Road Bridge over Sand Canyon Wash, Los Angeles County Bridge B1318, was constructed in 1960 [1963?] and includes a two-way traffic road surface with metal guardrails along each side. As it currently exists, the bridge is functionally obsolete and is eligible for Highway Bridge Program funding. Each lane is 14-feet wide. The total width of the bridge is 30 feet, and it is approximately 50-feet long. The bridge is constructed of seven pre-constructed and pre-stressed concrete box girders placed on driven pile abutments; it is free-span and does not have piers or columns. A separate steel-truss pedestrian bridge is placed along the south side; it is 8-feet wide and 50-feet long and accommodates light pedestrian and bicycle traffic throughout the day. Sand Canyon Wash is an ephemeral soft-bottom drainage that is a tributary to the Santa Clara River; upstream of the bridge there is a wood-plank siding on the west and wire-revetment on the east, which provide flood control. Downstream of the bridge, the wash is an earthen channel with pushed-up earthen berms to direct flood waters. It contains very minor native and non-native vegetation in and downstream of the project area. Sulphur Springs Elementary School is situated 300 feet west of the bridge and has a student population of approximately 700. During the morning and afternoon, the existing pedestrian bridge is overwhelmed, causing foot and bicycle traffic to use the roadway portion of the bridge. Traffic counts conducted during morning (8:00-9:00 a.m.) and afternoon (2:00-3:00 p.m.) peak hours determined this segment of Lost Canyon Road carries approximately 850 morning peak-hour vehicles and 550 afternoon peak-hour vehicles when school is in session. The pedestrian and vehicle traffic conflicts are further aggravated by vehicles arriving and departing from the Pinecrest Preschool adjacent to the bridge’s west end. This project will alleviate the above-mentioned conflicts by providing a dedicated path for pedestrians separate from the motoring public. The proposed project intends to create a multi-use pedestrian and bicycle path along the north edge of the existing bridge approximately 12-feet wide and will include 4-feet shoulders in each direction. The bridge expansion will be constructed similar to the existing structure with the addition of four pre-stressed/pre-cast concrete box girders, extending the existing abutments, and repositioning the wingwalls on the downstream side. The expansion will create a total area of 600 square feet over the existing Sand Canyon Wash. Construction of the bridge structure and road surface will be primarily from the top, however, equipment and materials may need to access the wash for the purpose of grading and constructing the abutments and repositioning the wingwalls. The design of this project will accommodate the proposed roundabout at Lost Canyon Road and Sand Canyon Road. On December 16, 2011, a Request for Proposal was sent to five firms with extensive bridge design experience: MNS Engineers, Inc., CH2MHill, Dokken Engineering, Tetra Tech, and Biggs Cardosa Associates, Inc. Of those companies, only three elected to prepare and submit a proposal to the City for consideration. City staff reviewed the three proposals and interviewed all three companies. During the interview, each firm was given an opportunity to present their team and expertise and demonstrate their understanding of the project and the requirements of the City. Biggs Cardosa Associates, Inc., and Dokken Engineering demonstrated detailed knowledge of those needs. Both firms presented the interview panel with technically sound and viable ideas and alternatives that would provide a quality design. MNS Engineers, Inc., prepared a proposal that insufficiently described the environmental studies required to obtain environmental clearance and missed key opportunities during their interview to present the panel with the importance of the environmental studies. It was this level of preparation, attention to detail, experience, and understanding that resulted in the significant discrepency in the scoring between the top two and the third-ranked firm. Considering the importance of the environmental studies and permits associated with this project, staff focused on the competency of the proposed design team relative to that portion of work and found Biggs Cardosa Associates, Inc., to have a well-qualified sub-consultant in Galvin Preservation Associates. The overall cost for MNS Engineers, Inc., (shown above) was revised to include the additional environmental studies they omitted from their original cost proposal. After considering the scoring from the written proposals and the results of the oral interviews, staff recommends Biggs Cardosa Associates, Inc., as the top qualified professional engineering services firm for the completion of the design plans, specifications, and estimate. Biggs Cardosa Associates, Inc., is investing locally by hiring a local subconsultant, Psomas, Inc., for surveying, mapping, hydrology/hydraulics, and drainage. Psomas, Inc., has performed various projects within the City. California Government Code 4526 prescribes selection of architectural and engineering services to be based on demonstrated competence and professional qualifications necessary for the satisfactory performance of the services required and does not authorize the selection of professional architect and engineering services based on cost. The City was able to reach an agreement with Biggs Cardosa Associates, Inc., at a fair and reasonable price. Adequate funds for the design phase of this project are currently budgeted in Accounts S3029238-5161.001 (TDA Article 3 Funds) and S3029229-5161.001 (Federal HBP Grant Funds). Any remaining funds will be used for construction costs. SC1230: 19200 dpi jpeg from .pdf.